It’s something about the smile. 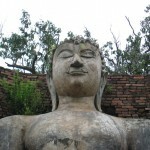 Throughout the ancient ruins of Sukhothai are hundreds of Buddha images, some small, some giant, but each of them has that famous serene smile, symbolising enlightenment and the achievement of Nirvana. Representing the pinnacle of Sukhothai’s craftsmanship from over 8 centuries ago, these images are what make this ancient city so fascinating today. Wherever you go, you can see the exquisitely carved enigmatic smile of the Buddha. It’s also the Buddhas that keep Sukhothai alive – each of the temples is still a shrine where people regularly come to pray, making them a part of modern day life rather than simply a museum for the ancient civilisation of the 13th century. 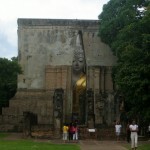 Sukhothai was the first independent Thai kingdom and this city was its capital. Even the briefest read of a guidebook provides a lot of food for thought whilst walking amongst the ruins, trying to imagine the full grandeur of each of the temples and the scores of wooden houses and bustling city life that existed around each of them. The city’s wooden houses and all its people are long gone, and the quiet tranquility of Sukhothai’s Historical Park is a welcome relief from the madness of Bangkok. Hired cycles are the preferred method of transport here, with few cars on the roads, which are surrounded by immaculately maintained grass and trees. Sitting within a valley around surrounded by mountains on all sides, Sukothai is a great reminder of Thailand’s abundance of space and natural beauty that is so easy to forget in the city. Wat Mahathat, at the very centre of old Sukhothai, was the spiritual heart of the city and was continually added to by successive rulers to create a sprawling, multi-generational monument. It dominates the surrounding wats, separated by its own moat. 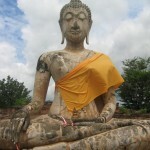 There are over forty different temples to explore within Old Sukhothai’s city walls, with the island temple of Wat Sra Sri and the Hindu-influenced prangs of Wat Sri Sawai being particular highlights. The importance of Sukhothai not just to Thai culture but also to world history is reflected in its UNESCO World Heritage status, which provides valuable foreign support and exposure for the historical park. 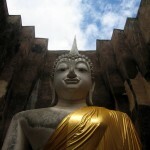 Outside the city walls of Old Sukhothai lies the giant, beautifully preserved Buddha at Wat Sri Chum. This has become the icon of Sukhothai, the four storey high statue now instantly recognisable from a thousand postcards and brochures. Unsurprisingly, tourists and locals alike flock to this wat and are not disappointed – the sheer scale of the statue is mesmerising, and the tight confines of the protective shield around it makes its size all the more overpowering. 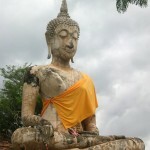 The image is known as Phra Achana – “One who is not frightened”. Despite its slightly obscure location, a constant succession of coaches arrive for tourists to take photos of the famous Buddha. If you’re cycling, you can wait around like the locals until it’s quiet between coachloads so as to get a private audience with the Buddha. 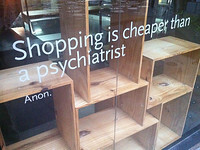 It’s an experience that lingers in the mind long afterwards. A short taxi ride away lies the Ananda hotel and, within its grounds, the Sangkhalok museum, which is an essential visit for any trip to Sukhothai. The museum is small and extremely well thought out – there are two floors of truly spectacular Sukhothai-era porcelain, knives, statues and busts that have been recovered over the years. Many of the plates and porcelain statues which have been recovered are completely intact and incredibly intricate in their design and beauty. Even for someone like myself who is largely ignorant about historical artifacts, this collection fires the imagination and helps reinforce quite how advanced and powerful the Sukhothai civilisation was. Any foreigner soons learns that an image of the Buddha is never mere decoration in Thailand, and the bronze casts of the Buddha’s head to be found in this museum are intensely lifelike, the height of the Sukhothai craftsmens’ skills. It’s also worth walking into the adjacent Ananda hotel, which has a magnificent giant urn located in its lobby and a shop full of interesting pottery and statue fragments. As a recently constructed boutique hotel built in a traditional style and furnished using local wood and silks, the Ananda has a distinct atmosphere all of its own, rather than the anonymous feel of a modern glass-and-concrete hotel. We stayed at the Ananda for three days and found the rooms to be comfortable and the staff very helpful. It’s a short tuk tuk ride into the town if you want to explore further. 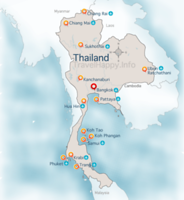 You can book the Ananda hotel online, and there’s also the Sukhothai Resort Hotel, the Tharaburi resort and the Pailyn Sukhothai hotel too. TripAdvisor has guest reviews of some Sukhothai guesthouses as well. 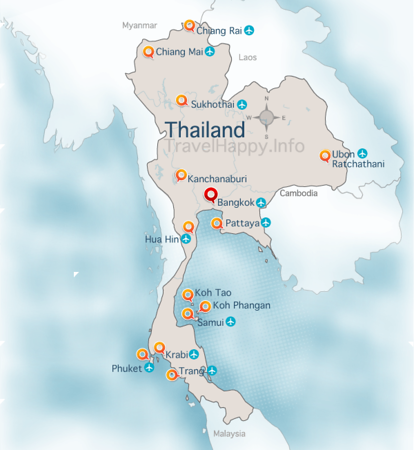 There is also a distinct atmosphere to the two national parks a couple of hours drive from Sukhothai, Si Satchanalai and Kamphaeng Phet. These two parks receive far less visitors than Sukhothai itself but they have numerous interesting temple ruins themselves which are well worth the extra time to see. Wat Phra Si Ratanamahathat at Si Satchanalai is particularly interesting, featuring a tower with 4 faces carved in Khmer style above its entrance. This looks remarkably similar to the face of Jayavarman VII, the Angkor king whose visage appears no less than 212 times at the Bayon Temple at Angkor Wat. 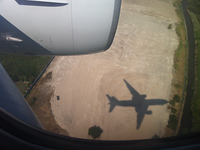 It’s immediately recognisable as the face that always appears on tourist literature about Cambodia. 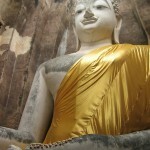 Its presence within Thailand indicates that this wat is possibly older than Sukthothai and dates back to the 12th century. What lies beyond the entrance is no less interesting – a huge stupa which can be climbed to visit the shrine built within it, and also several large Buddha statues within the well-preserved complex. Kamphaeng Phet park was deserted when we visited, which is surprising because perhaps the most beautiful Buddha statues besides that found at Wat Siri Chum is found here at Wat Phra Kaeo, the former home of Thailand’s holiest image, the Emerald Buddha. 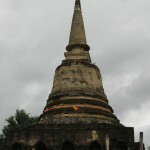 This large temple complex has dark brown brick ruins complete with a massive stupa. 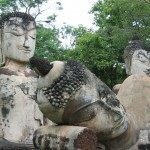 The centrepiece is three large white Buddhas, two sitting crosslegged and a third in the reclining position in front of them. Together they are quite awe-inspiring to behold, and the quiet of the surrounding area adds to their mystique. Sukhothai, then, provides a lot to think about – The ruins provides a portal back into Thailand’s fascinating history and the Buddhas themselves are not only amazing works of art but also provoke interest in Buddhism itself. The tranquility of the temples provides a perfect setting for taking some time out from the pressures of city life and getting some space to think about the bigger picture. There is much for Thais and foreigners alike to learn from Sukhothai, and it’s easy to understand why this place’s name means “Dawn of Happiness”.